Eagerly anticipated new album from distinguished Australian outfit The Guild League. Formed as a 16 member collaborative side project by The Lucksmiths front man Tali White, The Guild League released the jaunty single "Jet-Set... Go!" in 2001 and the wonderful debut album "Private Transport" the following year. Since then, the band has condensed its line-up and geographical focus. Described as "twelve songs about turning points, trust and the sky" the new album is the culmination of a fertile period of songwriting between White and guitarist Rodrigo Pintos-Lopez. Often performing as a trio with cellist Cressida Griffith, the Guild League has built a loyal following. 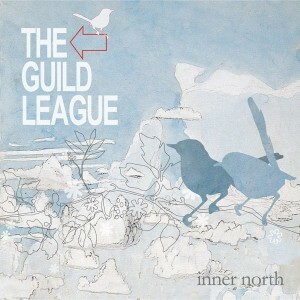 Musically, the intricate guitar and rich cello shape the "Inner North" sound. Around this rides White's rhythm guitar and galloping piano, the exemplary work of drummer-about-town Marty Brown (Art of Fighting), and bursts of brass from Guild League guru/engineer Craig Pilkington (The Killjoys). As always, Tali wraps his distinctive voice around words that warm and chill in equal measure. His lyrics shift like the Melbourne weather, from the sunny sensuality of "Citronella" and "Shirtless Sky" and the twilight optimism of "Animals" to the pre-dawn loneliness of "Time Please Gents" and the bittersweet saturation of "Falling Ovation" and "The Storm." Having gelled as a band, The Guild League has produced a self assured and cohesive second album. "Inner North" is unhurried, wryly humorous, proudly diverse and humbly beautiful.